One of the nice things about acoustic music over the past decade and a half is how eclectic it has become. Ever since David Grisman and his groups introduced so-called New Acoustic music, it seems that talented musicians with instruments that don't plug in end up making more interesting and sonically creative music than people armed with all the high-tech equipment the digital age has to offer. New Acoustic music happened when virtuosic bluegrass musicians decided to explore beyond the familiar and musically fairly simple standard repertoire. At first they delved into the harmonic and rhythmic aspects of jazz, but the style has grown to encompass all manner of ingredients from rock to more exotic world music influence. A lot of the most creative of the New Acoustic pickers have concentrated on instrumental music, such as mandolinist Grisman, guitarist Tony Rice and banjo man Béla Fleck. But there have also been vocal groups among the ranks of the very eclectic acoustic players, such as New Grass Revival, Tony Trischka's Skyline, and the more recent material by Tim O'Brien. This week's album is the second release by an all-star quartet of bluegrass notables formed to explore the possibilities of new musical ideas and arrangements. 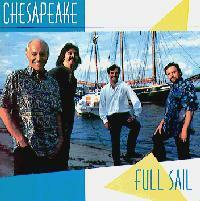 The group is Chesapeake, and their new release is called Full Sail. Chesapeake actually had its genesis in boredom during the bluegrass off-season. The liner notes of their first release, Rising Tide relate: "We all remember Jimmy [Gaudreau] calling us asking if we were tired of spending so much time during the long slow winter months folding clothes and watching dust collect in the corners. He knew this was the time of year most touring musicians found themselves with nothing musical to do. We agreed that watching dysfunctional daytime TV was not satisfying to our need to create. We couldn't wait to get together." Gaudreau is a mandolinist who goes back to Spectrum, Béla Fleck's first recorded bluegrass band and who is now working with Tony Rice. And the people he called up that time were bassist T. Michael Coleman, who accompanied Doc Watson for many years; Mike Auldridge, the dobro player and founding member of the Seldom Scene, and guitarist and vocalist Moondi Klein. Coleman, Auldridge and Klein are all current members of the Seldom Scene, a bluegrass band itself known for eclecticism. What the quartet did in Mike Auldridge's basement on Tuesdays was brainstorm with a goal of devising original treatments of familiar, mostly traditional material. They succeeded brilliantly on their debut, released in September of 1994. Now, even though the individual members remain in their respective bands, Chesapeake, as an extracurricular activity, is back with a nice new collection of material, ranging from very traditional songs going back to British Isles folk to a cover of a Little Feat tune. And as on their first album, they are not afraid to go a little electric, as well as eclectic. Dobro master Auldridge gets out his steel guitar which he plays sometimes in the twangy Nashville style, or hooks up to a distortion box and plays rock guitar licks. The quartet is also joined by drummer Pat McInerney for several tracks, so Full Sail is like their first album in being "mostly acoustic." The credentials of the musicians involved are all beyond reproach. Each brings lots of creative ideas as well as very tasteful playing to the proceedings. Vocalist Moondi Klein is perhaps the most prominent presence. With a background that includes operatic singing, Klein vocalizes in the high tenor range that is standard for bluegrass, not the so-called "high lonesome" style made famous by Bill Monroe, but in a warm, gentle voice more typical of an introspective singer-songwriter. While not traditional bluegrass in style, Klein is a very appealing singer. As they did on their last album, Chesapeake take some songs that are familiar, especially to folk and bluegrass fans, and rework them in unexpected ways, changing rhythms, phrasing, adding more contemporary and sophisticated harmonic ideas to the old songs, and sometimes going for an electric sound. And as on their first album, some of the arrangements are more successful than others. A couple of tracks could pass for Nashville country, while others will keep even the experienced New Acoustic fan fascinated. As for the song selection, it ranges from the Carter Family to the aforementioned Little Feat. There are also some contemporary tracks in the style of singer-songwriters. Full Sail the new second album by the eclectic extracurricular bluegrass outfit Chesapeake is another worthwhile album by four outstanding players taking time from their regular groups to create interesting, unexpected and mostly acoustic arrangements of songs ranging from very old traditional to bluegrass standards to a Little Feat cover. The combine superb musicianship and very appealing vocals with a sense of musical adventure which is not for diehard bluegrass traditionalists. Because of their experimental approach, some of their arrangements work better than others. Occasionally Chesapeake can get a bit too close to Nashville for comfort, and once in a while they get electric beyond what would one consider an acoustic band. But most of the CD is first-rate, and the choice and mix of material from Carter Family to Tom Paxton to new tunes is excellent. Sonically the album is an improvement over their debut, which had a few technical flaws, but there's still too much compression, on Full Sail, which robs the music of its dynamic range and some of its subtlety. Chesapeake is an excellent example of what happens when some hot pickers get bored, and decide to do something about it.